Rev. Seree Yeboa-Mensa (Ph.D.) has been married to Salomey Yeboa-Mensa since 2002. They are blessed with two boys and a girl. While in Mampong Technical College of Education, Ghana, he served on various committees within the Scripture Union (S.U). At the University of Education Winneba, he served as the President of the Assemblies of God Campus Ministries (AGCM) and also, the president of Ghana Fellowship of Evangelical Students (GHAFES) from the year 2000-2001/2. He was a member of the University´s Chaplaincy Board. Between 1992 and 2002, Seree had been preaching to children and young people in schools and churches. His insight into Holy Scriptures started in the International Charismatic Bible Church (ICC), Ghana, headed by Bishop Oppong Adu-Gyamfi. Seree was a Presbyter in this church until 2004 when he moved to Finland for further study. 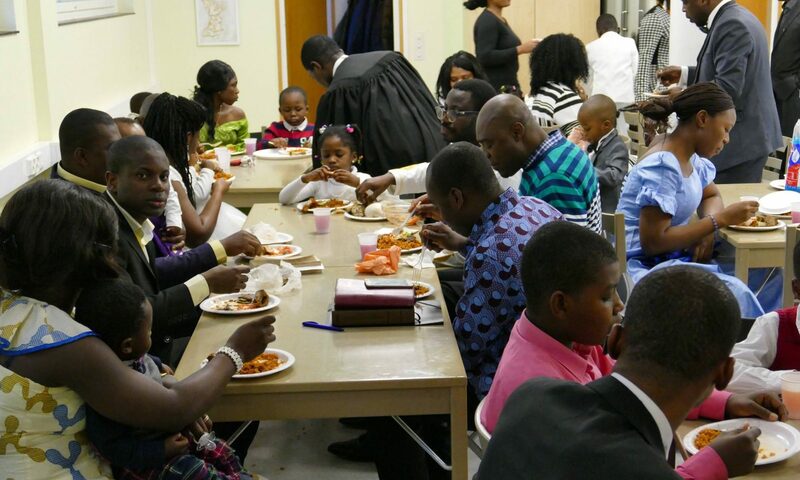 In Finland, Seree made himself available in other churches where he served on different committees, in addition to preaching and teaching the Word of God, until the Lord God gave him the responsibility to start and pastor the international Charismatic Bible Church (ICBC) in 2010. Rev. Seree Yeboa-Mensa was publicly ordained in the presence of the ICBC congregation by Bishop Oppong Adu-Gyamfi of the International Charismatic Church (ICC) in September 2015, during the ICBC´s 5th-anniversary celebration. Doctor of Philosophy (PhD) in Theology, 2010-2016, Northwestern Theological Seminary, USA. Vocational/Professional Teacher Education (Teacher Certification in Finland), 2014-2015, Haaga-Helia School of Vocational Teacher Education, Helsinki. Masters in Health Care Quality Improvement and Leadership Development (MQI), 2004-2007, University of Helsinki, Finland. Specialization Studies in Family Care, 2007, Laurea University of Applied Sciences, Finland. Bachelor of Social Services, 2015-2017, Diaconia University of Applied Sciences, Helsinki, Finland. Bachelor of Science Education, BEd (Physics major), graduated in 2002, University of Education, Ghana. 3-Year Post Secondary. Education, Mampong Technical College of Education, Ghana. GCE `O` Levels Amaniampong Secondary School, Ghana, 1987-1992. Seree also holds GCE A Levels and Senior School Certificate Examination (SSCE), issued by the West African Examination Council (WAEC). Seree Taught Technical Skills and Drawing (TSD) in Poano D/A Junior High School from 1996 to 1998. He also taught Physics and Integrated Science in Adventists and Kumasi Girls Senior High Schools between 2001 to 2004. He lectured the following courses in degree Program in Social Services at Metropolia University of Applied Sciences, from September-November 2015, as part of Family Care Module: Working Multiculturally with Families, Managing Culturally Diversity Families, Developing Family values, and Working Multi-professionally with Families.